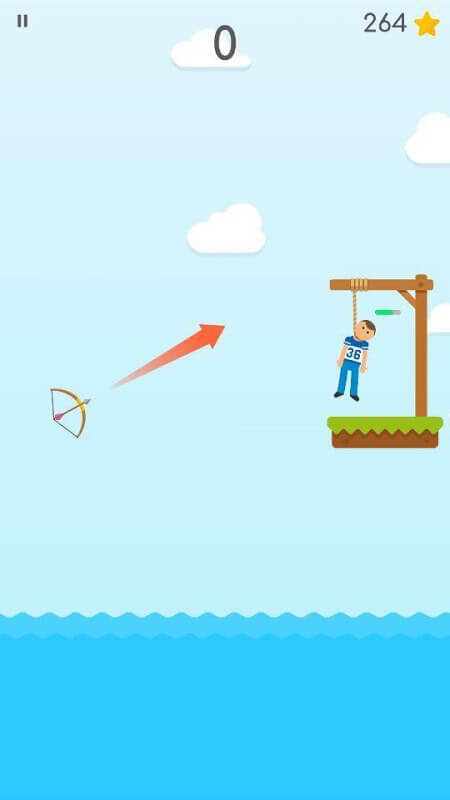 If you are looking for a game of relaxation to relieve stress and stress, Gibbets: Bow Master is the game you are looking for. With simple gameplay, fun graphics, this game will surely bring you exciting entertainment moments that will leave you tired. The game was released by HeroCraft Ltd (a game development company for mobile phones from Russia). Some of their popular games that you can try out are Warhammer 40,000: Space Wolf, Farm Frenzy Free, Ice Rage: Hockey Multiplayer, Tap Tap Builder … Although the trend of the manufacturer is the type of tissue life, and action, but this time they bring us a simple but equally attractive entertainment. Gibbets: Bow Master has a very simple gameplay, players only need to adjust the direction of the arrow and then shoot forward. 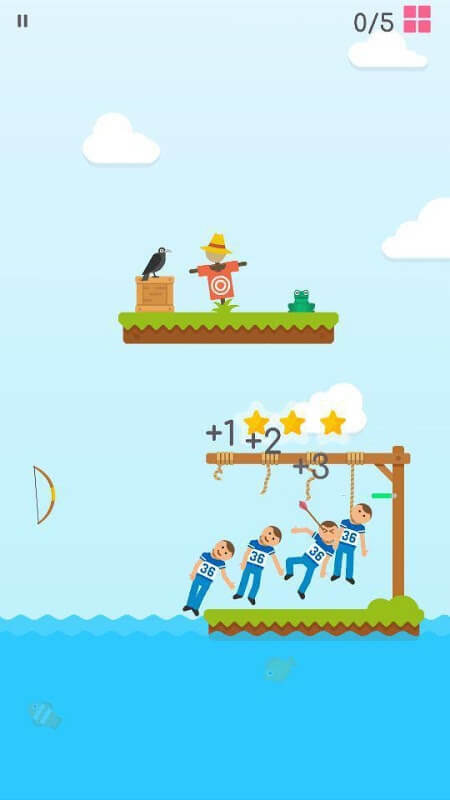 However, you have to shoot down the rope hanging many people. If you are not careful, you will kill them, not save them. 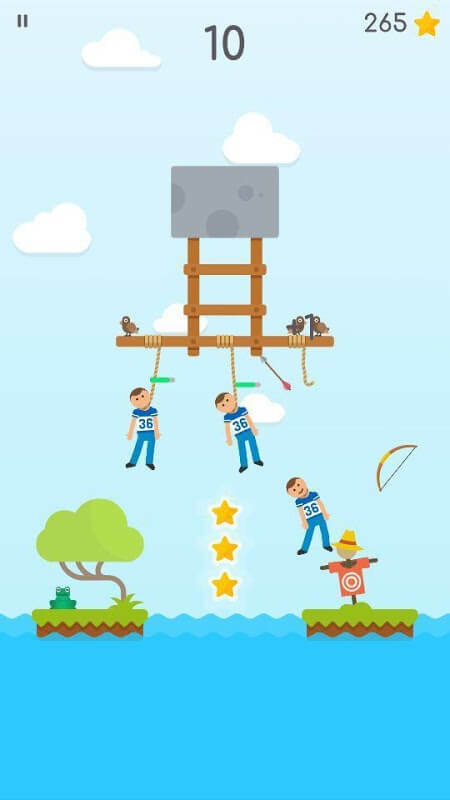 Later in the game became more difficult, so many hanged themselves, but you only have a single arrow. At this point, you have to shoot to hit 3 ropes in parallel. It was an extremely difficult challenge. The game has hundreds of levels with increasing difficulty, higher levels, narrower angles, and the more people you need help with. However, there is no way to pass. The game offers a lot of support items in the store, and players can use their bonus amount after each level to purchase the item. Do not forget that all the details that appear on the screen are valuable. For example, the wooden crates, you see it piled up, but did not know that you have to shoot the barrels that fall, then be saved. Because if you do not shoot the wooden crates first, the people you are trying to rescue will fall into the sea. Unlike other Voodoo or Ketchap games, Gibbets: Bow Master has an entertaining style. Even when losing, the player does not feel uncomfortable. Merely play that level is better. This is the unique thing to help the game became a fever in the past few days. The graphics of the game are not very special, the manufacturer is also smart enough to choose for their game a simple 2D graphics platform, the details are also drawn in the cartoon style that a lot of games Others have done. However, the highlight of the game lies in the gameplay as I have described above. This is a great entertainment game for everyone. If you are stressed out for a pile of work or hardships in life, look to this game, it will definitely make you smile. 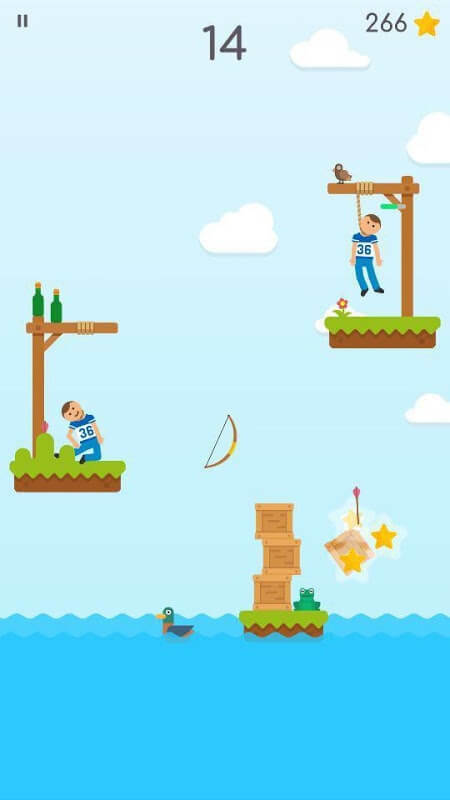 Gibbets: Bow Master is being offered for free on Google Play with in-app items in the game. We are glad that we have the unlimited money MOD on the net. If you want to experience this game in the best way, try downloading our MOD version.